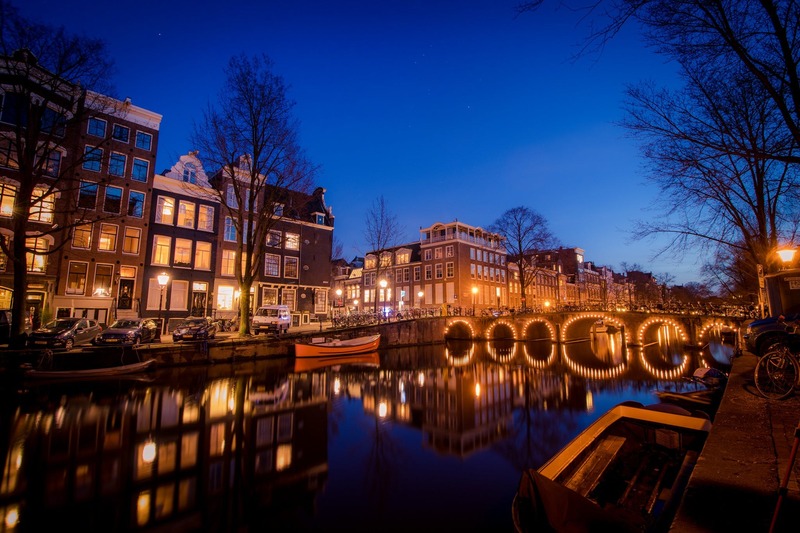 This month, Musement takes you to the city of canals, stroopwafels, Van Gogh and ganja. And of course, there’s so much more where these came from. Growing up, Amsterdam had always been a dream of mine. I would fantasize about this magical canal-filled city where everyone travels by bicycle, and pretty flowers and colorful birds populate the parks. A place where, just footsteps away from a beautiful church, half-naked women beckon passers-by from behind a glass building facade. A place where stoners emerge from coffee shops on a high, while a briefcase-toting businessman arrives to make a ganja purchase. In my mind, I had built Amsterdam up to such a surreal place, that when I arrived, I was amazed to see the city’s wonders realized in front of my eyes. I moved to Amsterdam after completing my Bachelor’s Degree in London, and was therefore already accustomed to the constant buzz of city life. Yet Amsterdam felt different. Even though there were tons of things to do, the city didn’t have a hectic metropolis vibe, but rather felt more like a town, friendly and–as the Dutch would say–gezellig. I moved to Amsterdam to pursue a Master’s Degree at the University of Amsterdam (UvA). Not only had I never been there before, I also didn’t know anyone there. Luckily, UvA came to the rescue with a room overlooking the university campus in the beautiful area near Plantage Zoo. I’ll never forget the green parrots that, every evening in September and October, would perch themselves on the tree outside my window and sing before journeying on to the park. Living on campus, I met made some wonderful friends in no time! The fact that I didn’t speak Dutch wasn’t a problem at all because pretty much anyone under 40 speaks good English. Plus, I love Dutch people: They’re friendly, open-minded and easy-going, always up for some fun. Some of my best friends are now Dutch, and I can’t thank them enough for the myriad of amazing experiences I had with them. Like when Josine, whom I had met just a few days earlier, invited me for a ride on her friend’s canal boat. 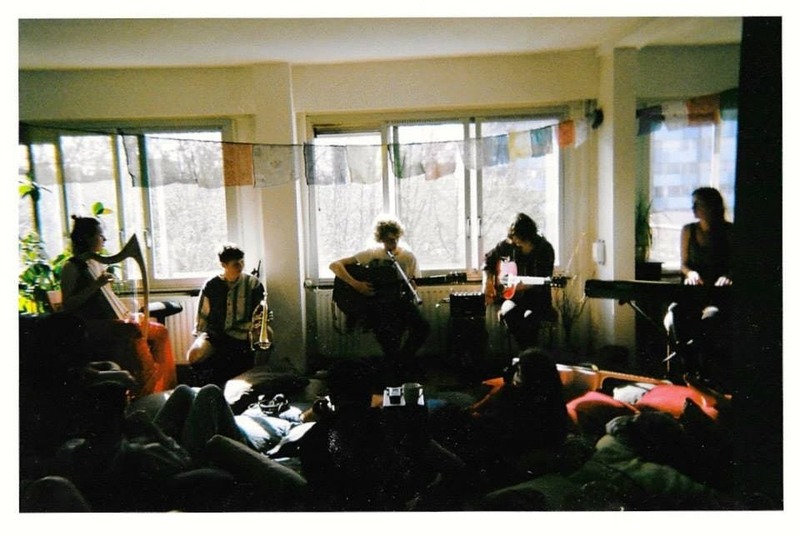 Or when, during a lazy Sunday, my friend Sophia brought me to an anti-squat art-house to see a live music gig (the first time I saw a band with a harp!) in a living room full of pillows, homemade muffins, tea and magic. Besides living room gigs, Amsterdam has one of Europe’s best music scenes. What makes it special isn’t only the quality, but also the breadth. Whatever type of music you like, there’s something for you. 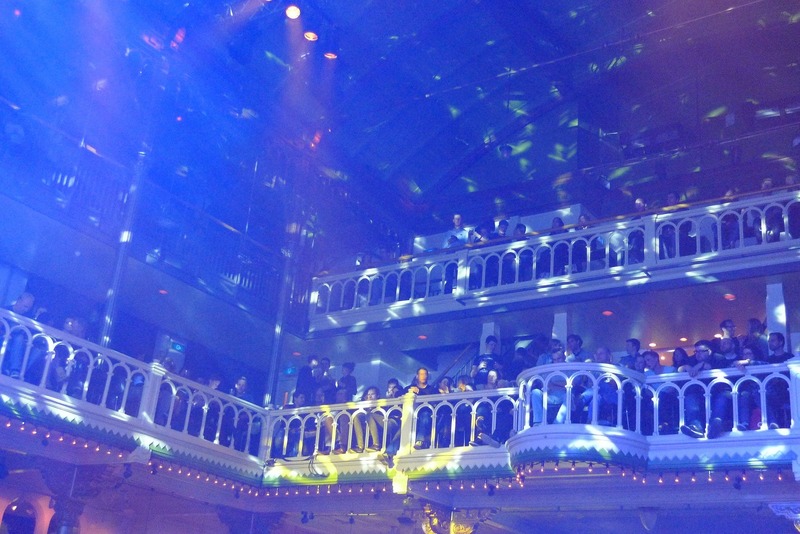 For concerts, visit Melkweg or Paradiso. One of my favorite venues, Paradiso is inside a converted nineteenth-century church that has hosted some awesome concerts since opening in 1968, from Nirvana to LCD Soundsystem. Jose Gonzalez gave one of the most enchanting concerts I’ve ever seen. Yet, the underground scene is a real gem. If you love rock and roll, visit the Pacific Parc on the weekend for a night of non-stop dancing. If you prefer music that’s a little more contemporary, OCCII or OT301 play everything from hip hop to drums and bass to Balkan tunes. For a chilled out experience, head to Concertgebouw for classical music while or Muziekgebouw for jazz. The hipstery Disco Dolly plays an eclectic range of music from classic 90s tunes to groovy disco keyboards to any other danceable tune. The Dutch love to party! As if this wasn’t enough (I’m talking to you, party animals), Amsterdam always has some kind of music festival or similar event happening. My favorites are King’s Day (Koningsdag) and the Amsterdam Dance Event (ADE). King’s Day (27 April) isn’t just for music. This Dutch national holiday celebrates the birthday of Willem-Alexander, the Netherlands’ current king. 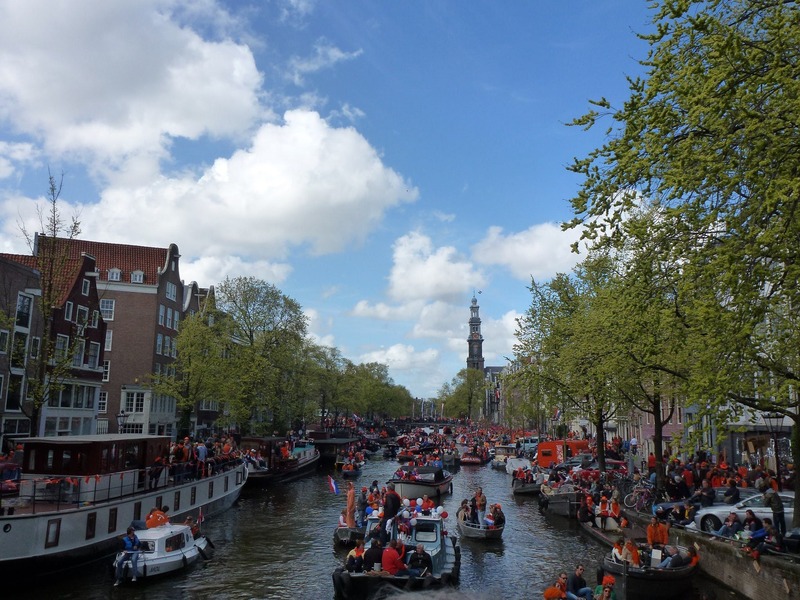 A massive orange crowd takes over the streets, parks and canals for an extravagant day of partying and festivities. The ADE, on the other hand, is a leading international festival that “covers the whole spectrum of electronic subgenres”. For five days in mid-October, artists are invited from all over the world to play in every venue in town….and not only that! 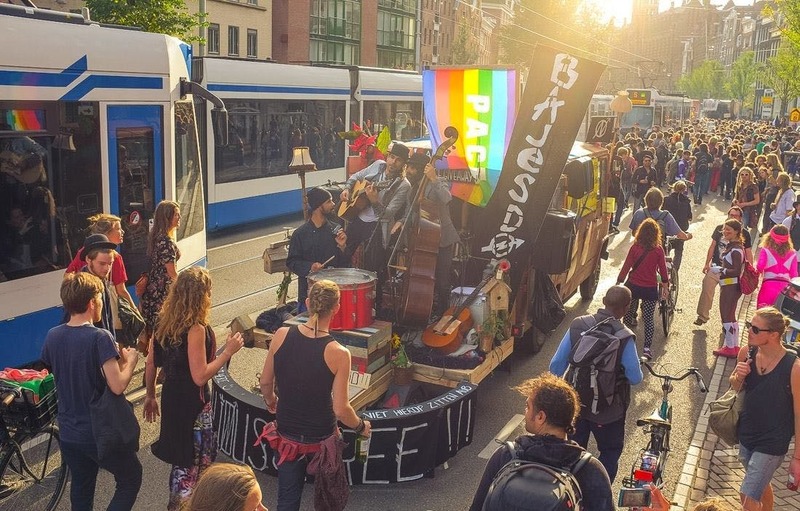 Locals organize alternative street parades throughout the city, and I remember it like it was yesterday. One morning I was recovering from previous days of ADE, my friend Edgar came rushing through my door out of breath with his longboard in hand wearing a you-don’t-know-what-I’ve-seen expression on his face. He said, “Get ready! Let’s go!” That was all I needed to hear. We rushed to Nieuwmarkt in the city center where there was a massive street parade with bands playing on moving trucks and people dancing all around. I remember a cute old couple who followed the parade in a tiny car, surrounded by convivial ravers who wanted to dance with them. There’s so much more to say, but I can’t possibly cover all of it here – just know that Amsterdam suits everyone’s needs. Art lovers won’t want to miss the Hermitage and FOAM while movie buffs must visit the EYE film museum and Kriterion, a student-run anti-Nazi art-house movie theater (+bar). Love beer? Then you MUST check out the Brouwerij ‘t IJ, an amazing brewery overlooked by a windmill. Prefer architecture/history? Just take a look around you pretty much anywhere you’re standing in the city! From the parks, street markets, cheese and beautiful historic neighborhoods, there’s much more where this came from, so I’ll leave it to you to explore. Whether you’re a stoner, hipster, party animal, an architecture/art/history lover, or whatever else, Amsterdam will make your heart sing.